Ultra Pure Magnesium Additive for 2-Part Maintenance in your Reef Tank! Maintaining proper magnesium levels helps achieve the essential balance of calcium and alkalinity in your tank by preventing excess calcium carbonate precipitation. Not all magnesium additives are created equal and the largest factor comes into the sulfate to chloride ratio in the magnesium solution. 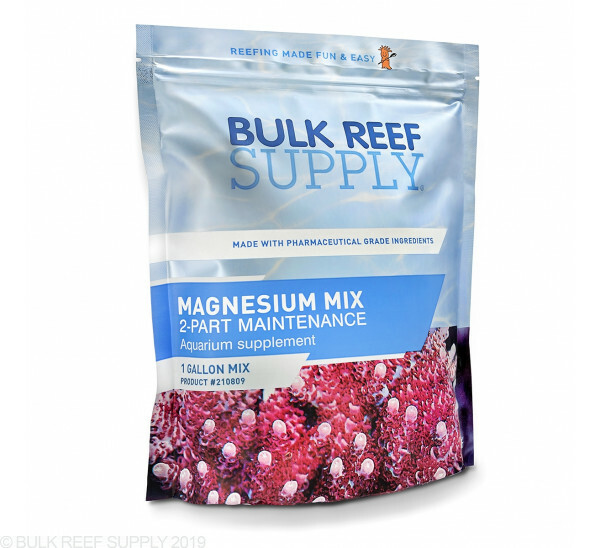 For large adjustments, you will want to use a magnesium solution that has limited amounts of sulfate to keep your reef balanced, where for daily 2-part dosing or maintenance, a larger amount of sulfate is required to keep your reef balanced. 2-Part Dosing or Small Adjustments - Fill a 1-gallon container 1/2 full of RO/DI or distilled water and then add the entire contents of the package into the container. Secure the cap on the container and shake it for about 10 seconds to help start the dissolving process. Remove the cap and fill the container the rest of the way with RO/DI or distilled water. Give the container a few more shakes and then let it sit until all the salts have fully dissolved before use. Knowing how much to dose is made simple using the BRS Reef Calculator! 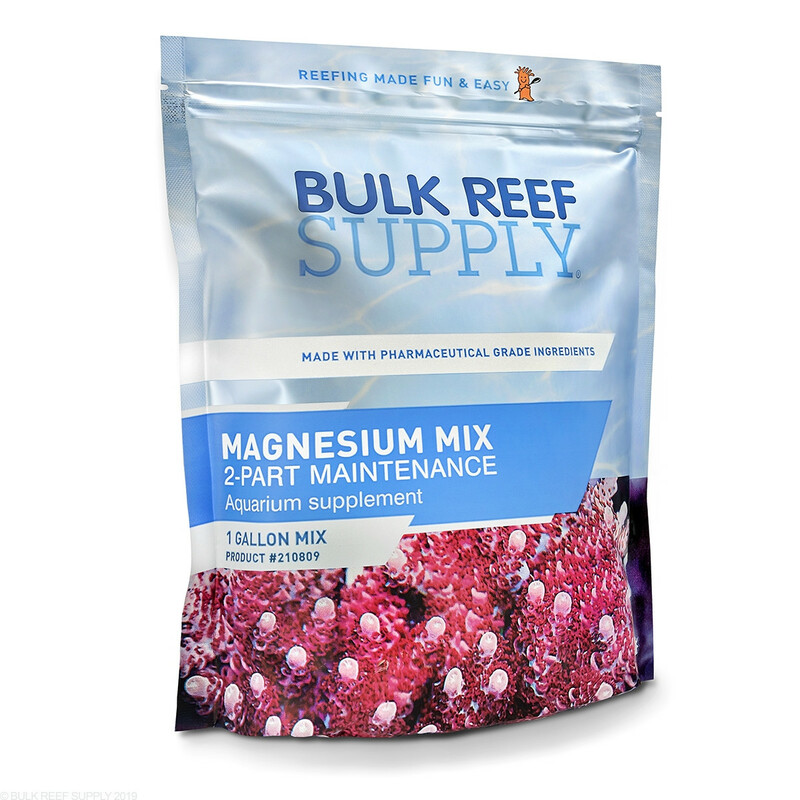 Create a 1-gallon solution by following the Mixing Instructions above and then test your aquariums current magnesium level and using the BRS Reef Calculator input your current and desired magnesium levels along with your total system water volume. Choose BRS Liquid Magnesium Mix (New Pharma Pouch) option from the drop-down menu and select calculate. The result will be how much magnesium solution you will need to add to raise your aquariums water volume to the desired level. We suggest adding small amounts at a time into a high flow area of the tank, like a power heads output or a sump baffle. It is important to keep changes limited to under 100ppm or less per day to not shock your corals. 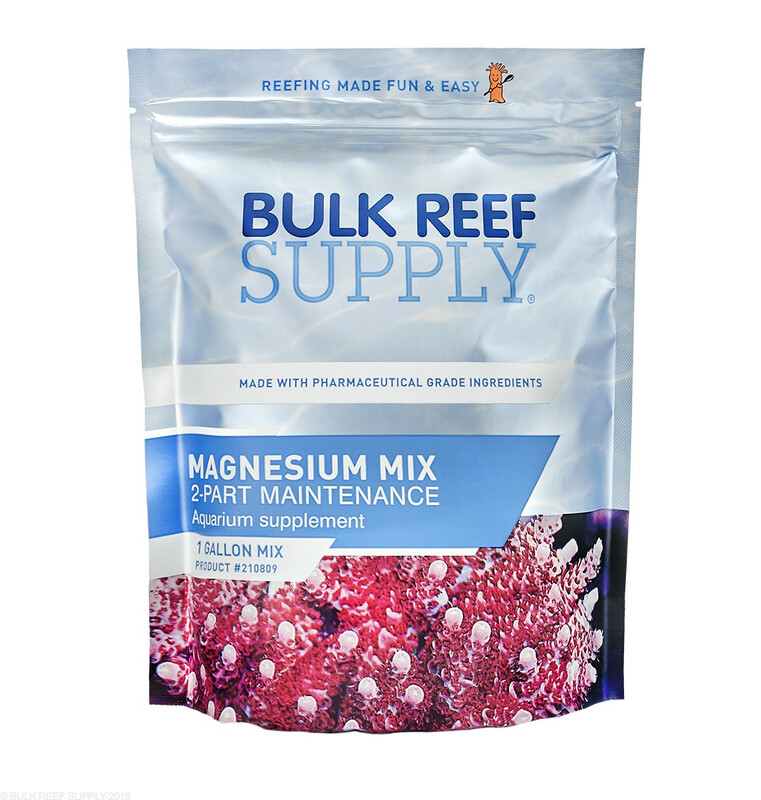 As corals grow they consume calcium and alkalinity but to keep the levels steady in a reef tank requires the use of magnesium too, so it is more like 3-part dosing, to be honest. Reefers will use calcium chloride and soda ash (sodium carbonate) to maintain their reef tanks chemistry daily and add a magnesium supplement every couple weeks. 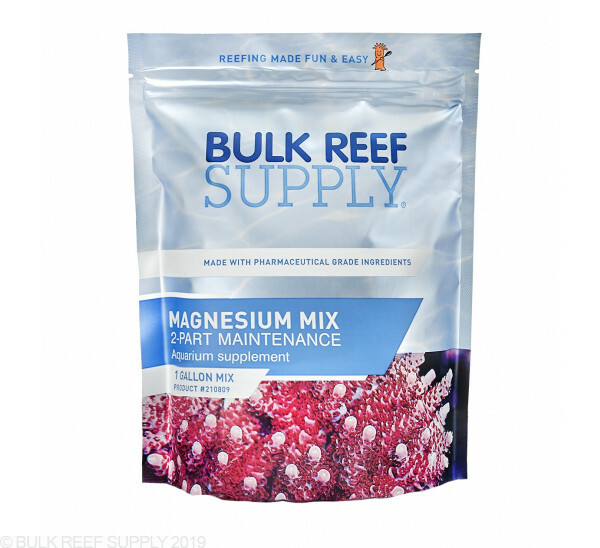 Magnesium supplements are usually a blend of magnesium chloride and magnesium sulfate to help keep the sulfate to chloride ratio balanced in the aquarium. When starting a 2 part dosing system it is important to use a good test kit to establish a baseline. We really like using the Red Sea Reef Foundation test kit or Hanna Colorimeters for their accuracy and repeatability which leads to a much more stable reef and overall coral health. Stability is one of the keys to keeping a saltwater tank healthy over a long span of time and most reefers will set up an automated system that doses their aquariums needed additives daily removing repetitive (and forgettable) chore. There are purpose-built dosing systems like the Kamor X4, Neptune DOS, or Bubble Magus T-11 that are super easy to program and keeps everything in a compact package, but there are other options that many reefers prefer like the BRS 1.1mL dosing pumps that can be paired with a digital timer for precise and affordable dosing control. I thought the 2 part BRS mixed good before. This new product is even better. Does what it's designed to do with less byproduct. What's even better is that about 5 days after receiving this from BRS I got a surprise in the mail with a second bag totally at no cost! It seems the product had changed crystal size and shape recently and BRS felt the necessity to alleviate any customer concerns by just sending out the new and improved version to the end user... me! Great customer service as usual from BRS! I’ve used other supplements to try to raise magnesium with no luck. I had to use way more solution with much less effect that was just used up right away ... it takes very little of this solution to raise magnesium significantly! I use this in a doser on my 85 gallon mixed Reef. It is so easy to use. In an attempt to save a little money in the long run I just ordered the separate components to the mix but it is the same high quality magnesium. If you are just starting to dose I definitely recommend this as it’s easy and you have a gallon to work with that should last a while. I used to by the individual components but they would get old and clump and then be hard to use and measure. This is easy and doesn't hurt the budget. I use BRS 2 part on a 90 gal packed with sps and this gallon mix will last for months so it doesn't make sense to buy bigger amounts anyway...get great results too! 8.99 vs 28.99 at my LFS made me switch. I recently bought a magnesium test kit and found out my magnesium was low. So I purchased this 2 part magnesium product. It came quickly, it was easy to mix, and my corals seem to like it.